Product prices and availability are accurate as of 2019-04-17 23:46:51 EDT and are subject to change. Any price and availability information displayed on http://www.amazon.com/ at the time of purchase will apply to the purchase of this product. 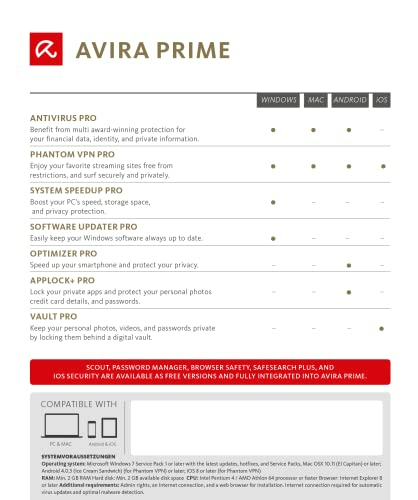 Avira Prime, the industry’s first all-in-one subscription service that provides individuals and households with convenient, no-obligation coverage for all of their online security, privacy, and performance needs. 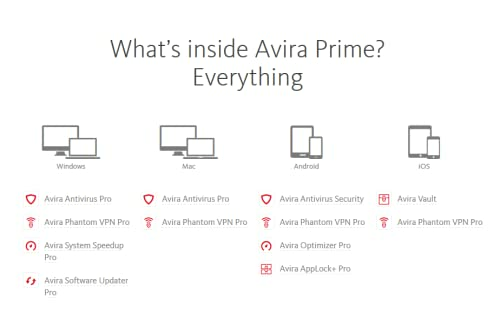 Use Avira Prime on up to FIVE devices in your household - from desktop to mobile. Windows, Mac, Android, or iOS… Avira has got you covered. 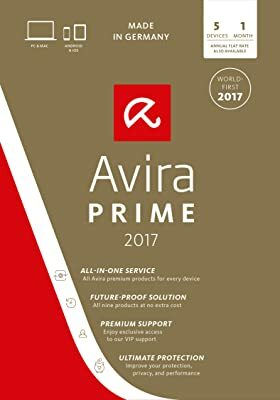 Avira Prime is for people that have a growing collection of online devices, know that they need to protect their privacy and security, but dislike contracts that tie them down, whether this is for accommodation, their automobile, or their phone. The Prime range of solutions cover the major operating systems for today’s growing portfolios of online devices, whether they run on Windows, Mac, iOS, or Android. With a simple subscription, Prime members get convenient, one-click access to all of Avira’s premium security and privacy solutions such as the award-winning Avira Antivirus Pro, Phantom VPN for online privacy, System Speedup Pro, and more. All of Avira's latest premium services – for protection, privacy, and performance – will be available to you, automatically, as part of your Avira Prime service. We know that you want convenience, flexibility, and freedom – so now you’ll have all the best premium solutions at hand, with a service that evolves with your needs. Invest just a small amount monthly, with no long-term commitment, for the services you need – now and in the future. You’ll have access to every premium software solution that Avira makes. Total control – how cool is that?! Your central dashboard shows device and service status at a glance, helping you add or remove premium services at will and giving you remote anti-theft/tracking tools. Lost phone? Track its location on a map. Protection – Security both online and off. Prime provides users with a full range of security against online threats, new ransomware variants, and the latest zero-day attacks. In addition to Antivirus Pro blocking out incoming malware, Avira’s security apps for Android also enable users to secure devices – and their data – from theft. Privacy – Covering tracks everywhere. Prime members can enhance their online privacy and security with Phantom VPN. Phantom wraps online communication in an encrypted envelope, securing it against Man-in-the-middle attacks throughout the transmission chain. Phantom VPN is also available in all four operating systems, enabling users to easily move between their home laptop or a smartphone on the go. Performance - Getting there faster. Avira Prime helps users keep their devices in shape and up to speed. Members get unlimited access to System Speedup Pro for Windows devices and the Avira Optimizer for Android, enabling them to easily remove old and unused apps, free up memory capacity, and protect against privacy risks. Avira Prime members are our number one priority and have exclusive access to our VIP Customer Support. With Avira Prime, members get unlimited access to all current premium products – and all new apps as they are released. Registration for Prime takes only an email. Prime membership subscription comes in two flavors, a simple annual payment or a monthly flat rate. Both annual and monthly options enable Prime members to receive more features at a lower cost than they would if these services were purchased separately. Prime is also a major timesaver, reducing the time spent searching for apps that could deliver the needed functions across all four operating platforms. Getting all devices under the Prime umbrella is easy. 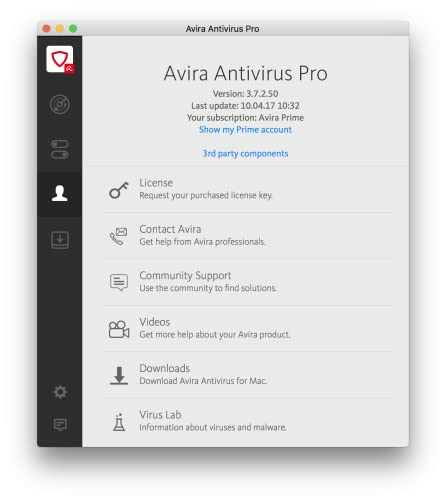 After subscribing at avira.com, users are sent an email with download links that can be forwarded to all of their other devices – regardless of whether they run on Windows, Mac, iOS, or Android. In addition, each Prime member is registered at the Online Essentials dashboard, enabling remote device management and the directly downloading of all apps from this location. The dashboard shows the online health of all of the covered devices, equipping the dashboard user to remotely add or remove services at will – without having the device at hand and without any extra cost. 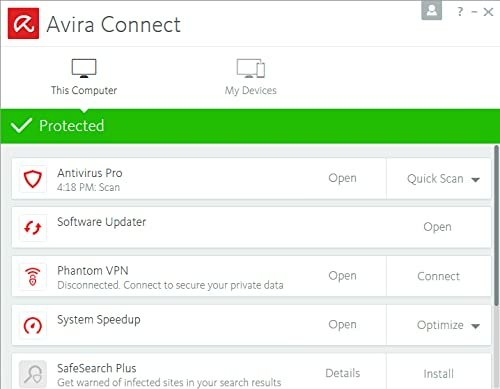 Use Avira Prime on up to 5 Windows, Mac, iOS or Android devices in your household - from desktop to mobile Central dashboard shows device and service status with device anti-theft and tracking tools Includes award-winning Avira Antivirus Pro, Phantom VPN for online privacy, System Speedup Pro, and more.